President Muhammadu Buhari places the 2019 Appropriation Bill on the table after his presentation to a joint season of the National Assembly in Abuja. Abuja — As the National Assembly resumes the day after tomorrow, there are indications that the lawmakers would hold plenary for just five legislative days, beginning from Wednesday to Thursday next week before adjourning for four weeks to take part in the forthcoming general elections. A source close to the Senate leadership told LEADERSHIP that the lawmakers will hold plenary on Wednesday and Thursday this week to set agenda for debate on general principles of the N8.83trillion 2019 budget presented to them by President Muhammadu Buhari on December 19 last year. The source who did not want his name in print expressed fears that serious legislative work on the 2019 budget proposal may suffer due to lack of budget details expected from the executive arm of government. The office of the Senate Leader, Senator Ahmed Lawan (Yobe South, APC), confirmed that upon resumption from Christmas and New Year break on Tuesday, the most prominent issue that will take the attention of the Senate is the Appropriation Bill. LEADERSHIP gathered that the debate on general principles of the budget will hold at both chambers from Tuesday to Thursday next week (22- 24 January 2019) for the required passage for second reading and consideration at committee levels where heads of the various federal Ministries, Departments and Agencies (MDAs) would appear for defence of budgetary allocations proposed for them in the fiscal year. But there is a growing concern that lack of sufficient details from the executive arm of government could pose some challenges for the budget preparations. 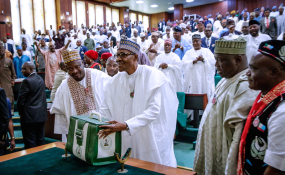 When President Muhammadu Buhari presented the 2019 budget proposal to the joint session of the National Assembly on December 19, 2018, he disclosed that further details would be provided to lawmakers to enable them to commence work. But Clerks of committees who spoke to our correspondent on condition of anonymity said that lawmakers are still waiting for such details, including the sector by sector analysis of the budget document as well as its comprehensive revenue profile. A senator however hinted that this budget bill would be one of the most difficult legislative assignments for the National Assembly in view of issues that have arisen since it was presented last month. He cited the example of the sharp drop in revenue, particularly the fall in the price of crude oil internationally. The lawmaker said, "You also know that no matter how fast we desire to pass the budget, all that will depend on the co-operation from the executive arm of government, especially the MDAs. As much as I know, what the president presented was mere summary and it is expected that the details will be provided before we resume. "As we talk at the moment, I am not aware of such details. So, the entire situation will be dictated by the level of information we get on the floor of the Senate on Tuesday". Although debate on the general principles of the budget bill may be done this week, lawmakers' political exigencies may also limit their contributions to the budget processing process. But feelers from leadership of both chambers indicate that on the last day of the debate (Thursday next week), motions for adjournment of plenary to Tuesday February 19, 2019, would be moved and adopted to create time for the lawmakers contesting in the elections to campaign, while those not contesting will be engaging heads of the various MDAs at budget defence sessions. Specifically in the Senate, 68 out of the 109 serving Senators are contesting in the February 16 elections on different political platforms for return bids into the Red Chamber, while eight others are on the political field in their respective states contesting for gubernatorial elections slated for March 2, 2019. The 33 other Senators not contesting for any elective position in the coming elections are expected by the planned legislative arrangement to keep the budget defence sessions alive, while their colleagues slug it out with their various opponents on the political field. Giving credence to the planned arrangement, one of the principal officers in the Senate told LEADERSHIP yesterday that "suspension of plenary for weeks preceding the presidential and National Assembly elections after pushing consideration of the 2019 budget to committee levels at both chambers is the best arrangement that can be put in place for the federal lawmakers directly participating in the elections as candidates of their various political parties". The source added that "such an arrangement would keep legislative business alive at both chambers from Wednesday this week to the time of elections and even after, particularly on consideration of the 2019 budget proposals". Some of the 33 serving Senators who are not contesting for any position in the elections and are chairmen of Senate standing committees include Shaaba Lafiagi (National Security and Intelligence) , Abu Ibrahim ( Labour), Emmanuel Paulker ( Establishment) and Bukka Aba Ibrahim ( Environment ). Others are Ahmed Sani Yerima (Marine Transport), Olugbenga Ashafa (Land Transport), Lanre Tejuoso( Health), Gilbert Nnaji ( Communication), Tijjani Kaura ( Police) , Kabiru Marafa ( Petroleum Downstream) etc . Aside the 2019 budget, both chambers of the National Assembly may also use the same template of legislative engagement to consider the proposed new minimum wage bill that may be forwarded to them by the executive next week Wednesday as hinted by the Minister of Labour and Productivity, Dr Chris Ngige, last week. If the bill gets to both chambers on the said date, expeditious consideration may be given to it on Thursday January 24, 2019 at plenary for passage for second reading and consideration at committee level during the planned four weeks suspension of plenary. Incidentally in the Senate, Senator Abu Ibrahim (APC Katsina South), who now chairs the Senate Committee on Labour, is not contesting for any elective position in the next elections .